I remember the old bumper stickers back in the day that said “Unemployed? Hungry? Eat your Japanese car!” There were several versions, but eat your import was the basic crux. These were created and distributed by unions to help foster the Buy American mentality, and was, all in all, an abject failure. Why? Many reasons, and they include American manufacturings arrogance, and the drive of other nations, in the past, Japan, now South Korea and China, to be the best, to make things fast, cheap, and high quality. I remember reading a story from the 1960’s where a US auto executive was asked if the US auto industry feared the juggernaut Japanese auto manufacturers, and he calmly said no, the US auto industry had no fear, why, they could turn back the Japanese auto invasion anytime, at will if and when they wanted, and would do so if, or when, the time came. The time came. The response? 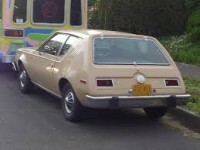 The AMC Gremlin and Pacer. Yeah, the US auto industry was in trouble, but not so deep they didn’t stand a chance. After all, the Japanese cars of the time weren’t very good either, they were too small and ugly as sin, but they had a couple things going for them, which I’ll get to in a moment. No, chrome and horsepower trumps all, right? Well, yes and no. Bottomless pockets? Yes, to an extent, but the average worker in that era needed, wanted a little more, even if the cars were dreadful to look at. 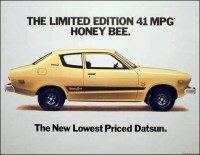 The Datsun Honeybee. Need I say more? The Oil Embargo and our own emission laws, combined with an infrastructure change from leaded gasoline to unleaded gasoline doomed the US auto industry, though it would fight for many years. Japanese automobiles also lasted a long time. In the late 60’s (and earlier) through the mid 1980’s it was quite a feat for an American car to last 100,000 miles. So rarely that it happened that folks would have 100k parties to celebrate. Japanese cars routinely arrived at 100,000 miles with aplomb, and with rare (and costly) repairs. VW bugs did too. In fact, most cars from overseas made that milestone fairly easily, provided routine maintenance was carried out. Well, that is except anything from the UK or Italy. Or France. Import cars also went further on a gallon of gasoline. A lot can be said for minimalism, and in cars, a smaller, lighter vehicle with a commensurately smaller engine is usually more efficient with fuel. True. The cars were generally cheaper to buy as well, and kept their value pretty well. So you have an inexpensive car, that’s cheap to operate, will last a long time, and holds its value well. And we counter with the Vega? Arrogance and shortsightedness did it to Detroit. The fast response to the Japanese car invasion was derailed. It was weak. It was over promised and under executed, and Toyota, Datsun-Nissan, Honda et al were not done with us yet. 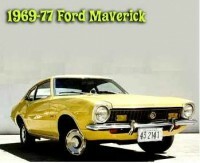 Better looking, and even BETTER built cars with even better gas mileage were on the way. Soon, and it’s almost like the foreign auto makers knew we’d fall back on the Buy American Made campaigns, because soon all these foreign automakers opened design studios in the US, designing their cars right here, and shortly after they were assembling the cars here using American labor. Soon after that they began fully producing their vehicles here, stamping, wiring, engine plant, the whole she-bang. Henry Ford, Durant, Chrysler, Ransom E. Olds, and the Dodge Brothers must have been spinning in their graves. So the fall back? Buy American. Eat your import. Slogan-ism was going to turn the tide. Yeah, right. Just like Change, right? It was not just cars and trucks either. Name a US made television. Bet you can’t. ANYTHING electronic that’s made here in the USA? Extending it further, what exactly is made here at all in the US of A? Franchises. Lots and lots of franchises. Consumer goods, like toilet paper. Food, lots of food. What else? Lumber, but we do import lumber and other building materials. Remember the Chinese drywall that was being imported that caused corrosion of silver and awful rotten eggs like smells during the building boom? It had to be removed and replaced in many cases. Oh, and we build houses, in a nation with so many vacant houses, despite the recent uptick in prices, there are still so many more empty houses in this country that it boggles the mind. What else do we make? Oh yeah, welfare recipients, people who use the welfare system as an occupation. Don’t get me wrong, those who genuinely need assistance ought to get it, however there are able bodied men and women who are fully capable of holding jobs, but don’t. Oh, and reality TV shows. No wonder this nations in such trouble. So what we have here is: a decline of pride, a decline of the manufacturing base, a decline of America’s ability to fend for herself when it comes to necessities and niceties. Not long ago the knucklehead in North Korea was threatening to nuke the west (he can’t yet) and more notably, South Korea. A few people I talked to said things like I better get my Samsung Galaxy phone now, because if he nukes the south, bye bye Samsung. And a lot of other large businesses too. 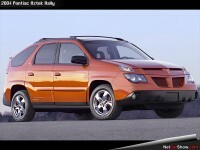 Oh yeah, another vehicle that was an import fighter, but more recently, the Aztek. Wonder why Pontiac is no more? Google an image, and that’s why. Maybe the Pontiac reasoning was like “Well, the Japanese sent us ugly as sin cars that had advantages, maybe we’ll make a very useful car that’s even uglier than anything the Japanese have ever made” If that was the case, you succeeded! Dummies. 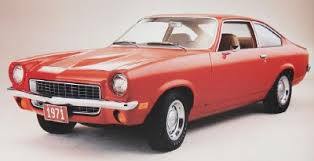 So thinking about this topic today, I chanced, once again, on a Chevy Cruze, a vehicle that is every bit the equivalent of a Japanese car in build quality and this is the car that, had it been introduced in the 1970’s (but of course with period materials, but with Japanese build quality) it stood a chance the Chevy Vega never did. On the same journey today I also, once again, happened upon a Chevy Volt, a vehicle built on the Cruze’s platform, but entirely different. And that’s when it struck me, the continued stupidity of US automakers. So here you go Detroit, et al. You have a WINNER in the Cruze. You use the Cruze platform. you then style it with a goofy glass window in the trunk ala Aztek (aka SpAztek) and put goofy colors in different areas and add odd body cladding like a good old dead Pontiac. Good thinking. Here, try this on: Use the SAME body as the Cruze, a winner, (change as needed for the drive train) , and just call it a Cruze Volt. How simple would that have been? You toss Olds and Pontiac and keep Buick? Olds was perfectly named to be a retro-car brand, but with modern day tech. Can you say HHR and PT Cruiser? Retro. Pontiac, well, after Aztek nobody was going to take them seriously, so yeah, but with the Holden cars coming from Australia, the G6, G8, those were FANTASTIC cars! WHAT WERE YOU THINKING?!? So what to do. America needs to revitalize it’s manufacturing base. Unions have to stop demanding so damned much. It helped drive Detroit under, as well as other companies like Hostess. Unions have to tow the line like the rest of us, and put America first, ahead of their own interests. I’m not saying to give anything up, the unions that is, just step back a bit from the trough. Put down the fork. American must become innovative once again. Obama’s solar power fiasco was badly done, but it was a step in the right direction. We need to work on becoming energy independent. My God, we have the brains, man power and American ingenuity to do it, so let’s do it! Let’s work, all of us, on making this nation great once again. And no, I’m not going to be eating any Japanese cars any time soon. And when you can, buy American.